Many of the stars seen with the naked eye at night, are in fact double or triple star systems. On this page are presented a selection of images of some of the more well known systems. 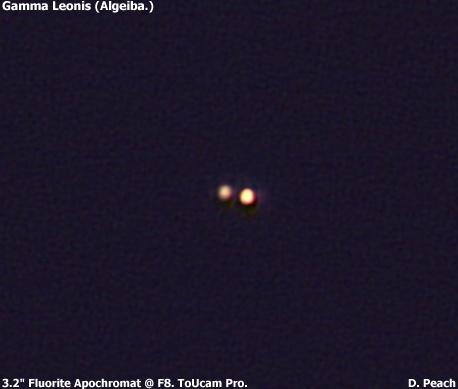 Nu Draconis C14HD with ASI224 camera. Mu Draconis C14HD with ASI224 camera. 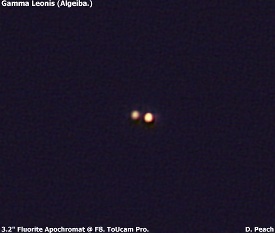 Eta Cassiopeae C14HD with ASI224 camera. Epsilon Equulei C14HD with ASI224 camera. 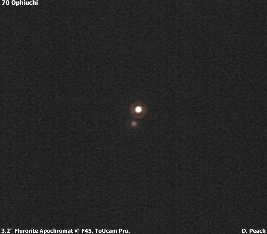 Beta Cygni (Albireo) C14HD with ASI224 camera. 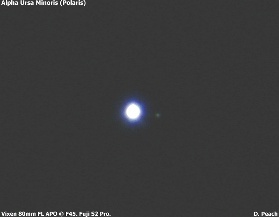 95 Herculis C14HD with ASI224 camera. 61 Cygni C14HD with ASI224 camera. 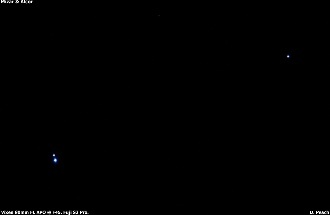 32 Cygni C14HD with ASI224 camera. 17 Cygni C14HD with ASI224 camera. 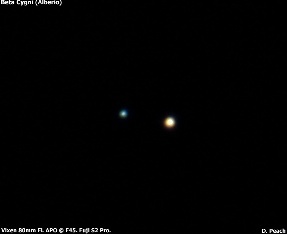 Sirius & Sirius B. A famous challenging pair tough to see because of the great brightness difference between the components. 14" SCT with ASI174MM. Barbados. Mar 2015. 10" Mewlon @ F50. SKYnyx 2.0. FL, USA. Feb 2008. Gamma Virginis. 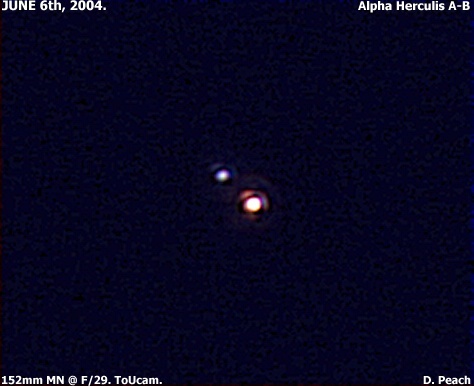 Seen here in 2005 during when the two components of this system passed through thier closest. The seperation is around 0.35" arc seconds. 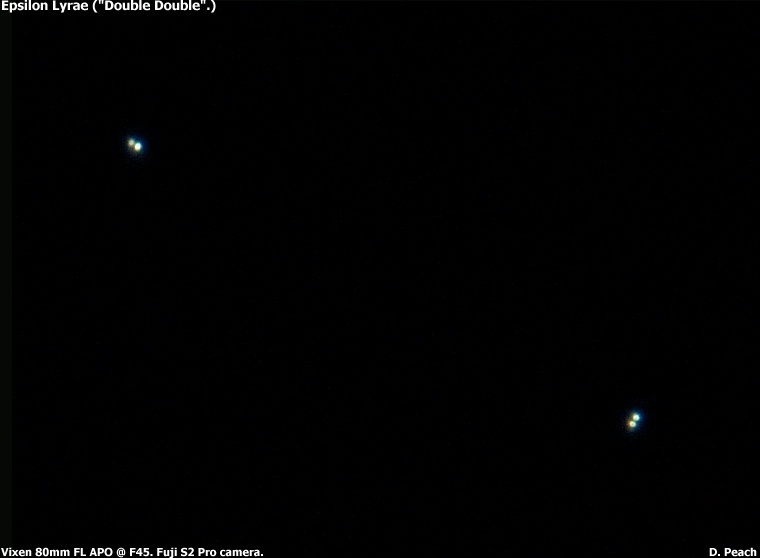 These images taken using a 9.25" telescope clearly show the elongated pair. 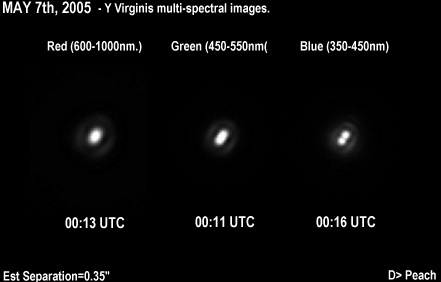 The multi-spectral set clearly shows that the resolving power of the telescope is better at short wavelengths. C9.25@ F42. LU075 camera. Barbados W.I. 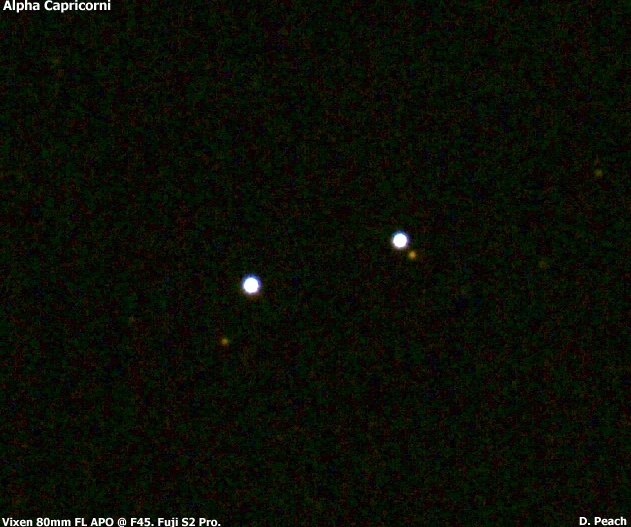 Binary System Alpha Capricorni. 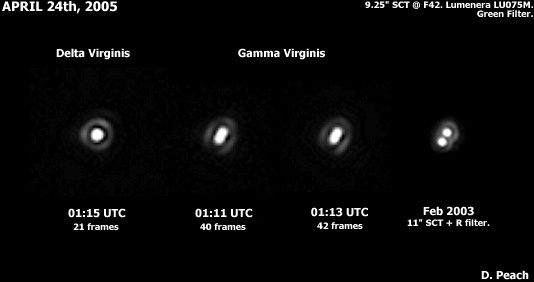 A nice multiple system well seen in modest size telescopes. Vixen FL80s & Fuji S2 pro. Binary System Zeta Cancri. A well known triple system. 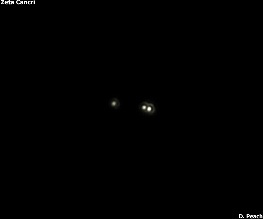 The wider pair are separated by 6" arc seconds, but the bright star is itself a much closer system, with a sixty year period. The separation is currently 0.8" arc seconds. 11" Schmidt Cassegrain @ F31. Philips ToUcam. 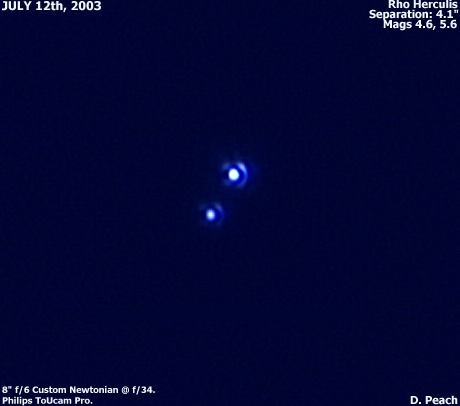 Binary System Rho Herculis. 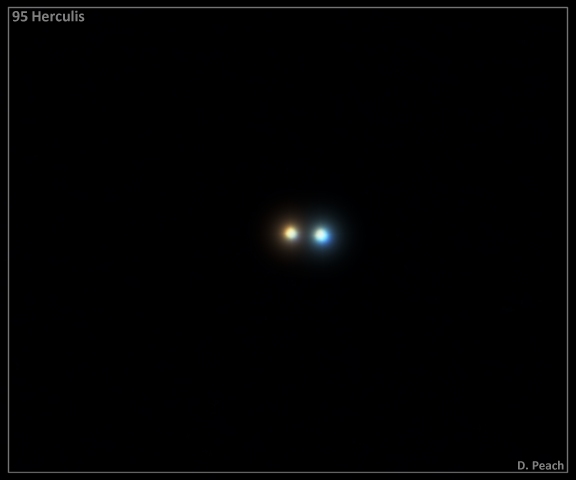 This lesser known pair consists of magnitude 4.6 and 5.6 stars separated by 4.1" arc seconds. Vixen FL80s @ F45. Fuji S2 Pro. 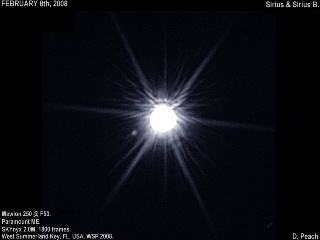 Double System Alpha Ursa Minoris. 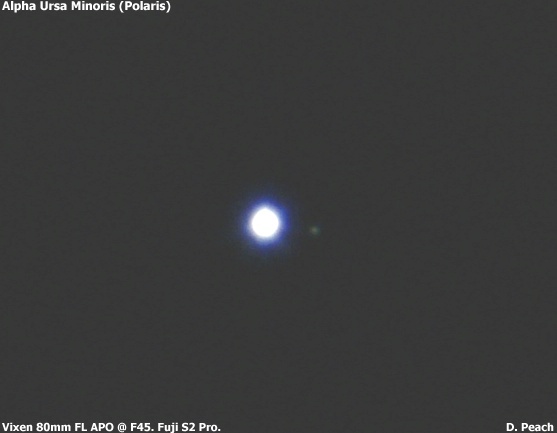 Better known as Polaris, the double consists of the bright magnitude 2.1 primary and an optical 9.1 secondary 18" arc seconds away. 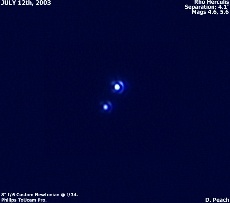 Binary System Zeta Ursa Majoris. 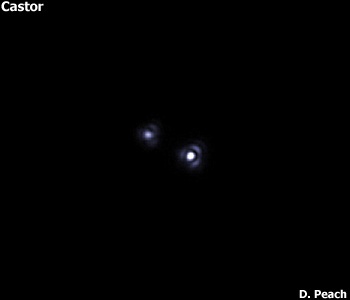 Possibly the most famous binary system in the sky. 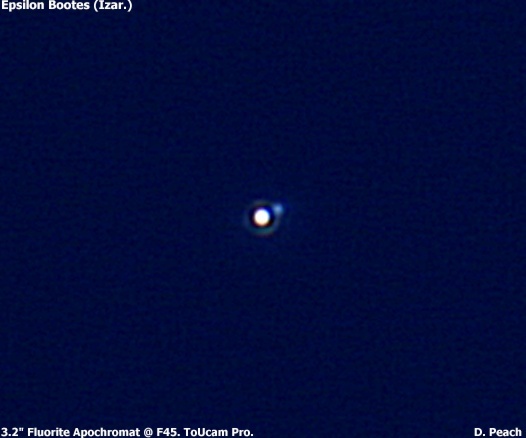 The star Alcor lies 11" arc mintues away making Mizar and Alcor an easy naked eye double. 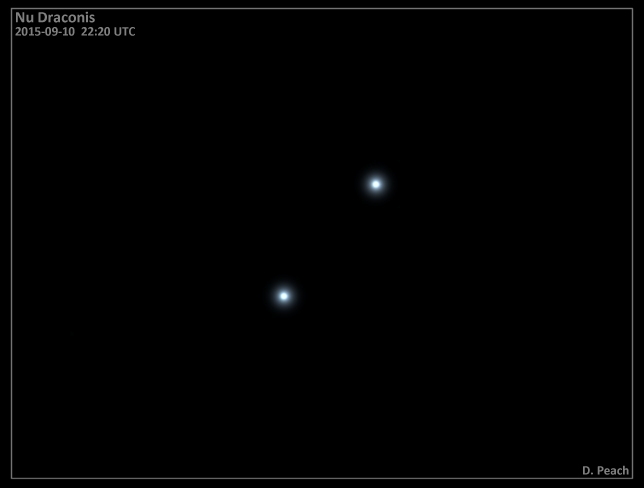 Mizar itself is a closer pair of magnitudes 2.4 and 4.0 separated by 14.5" arc seconds. 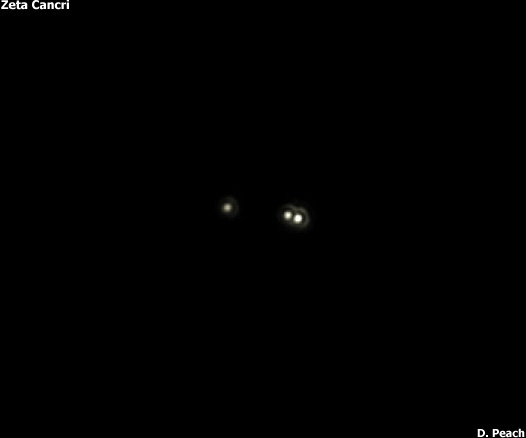 The two stars of Mizar are themselves very close binaries. Binary System Epsilon Bootes. Better known as Izar or, as Struve called it "Pulcherima" - the most beautiful. The fine pair of an Orange primary and blue secondary can be seen well in small telescopes. The magnitudes are 2.7 and 5.1, while the seperation is 3" arc seconds. 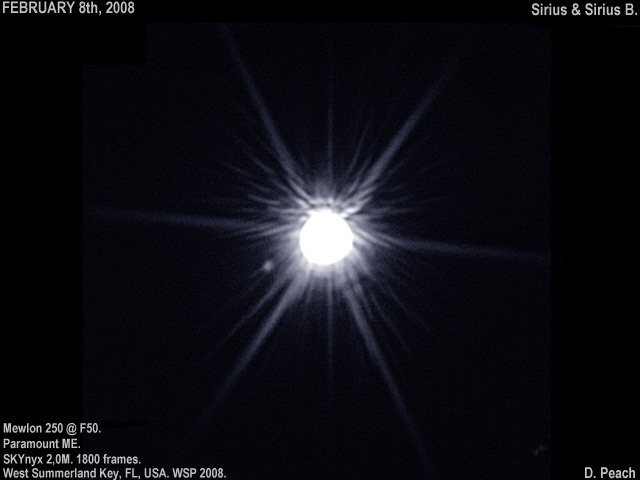 The above images show the views in a 6" aperture telescope at left, and 3.2" aperture telescope at right. 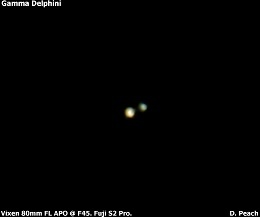 Left: Intes 6" F/6 Maksutov Newtonian @ F59. Philips ToUcam. Right: Vixen FL80s @ F45. Philips ToUcam. 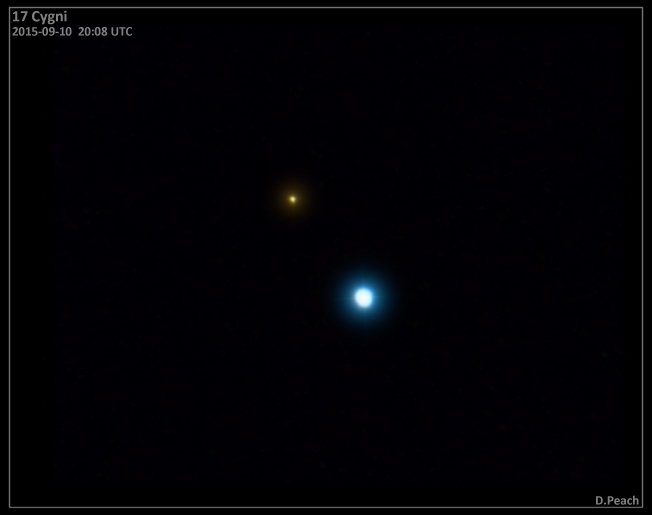 Binary System Gamma Leonis. Another fine colourful pair of an Orange primary and greyish secondary. The magnitudes are 2.2 and 3.5, while the separation is 4.3" arc seconds. 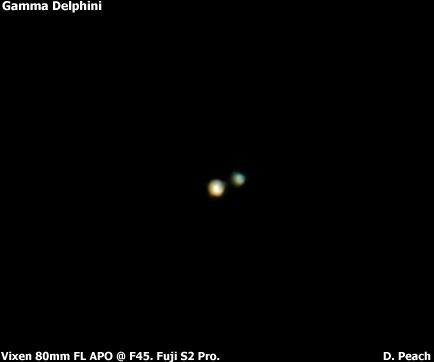 Binary System Gamma Delphini. 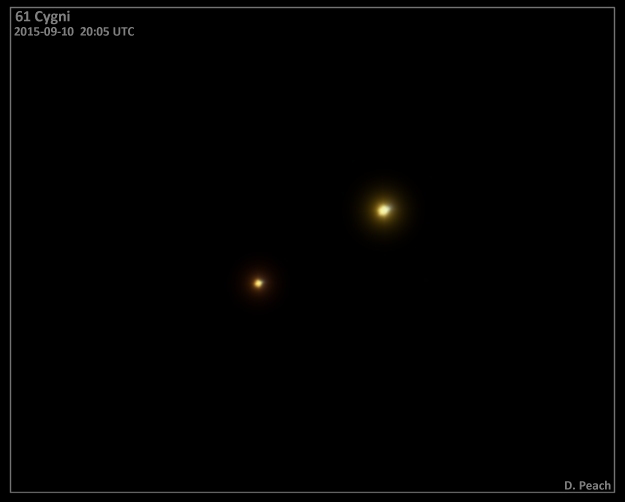 A splendid yellow pair of stars of magnitudes 4.5 and 5.5. The separation is 9.5" arc seconds. 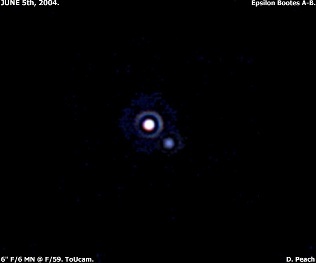 Binary System Epsilon Lyrae 1 & 2. More famously known as the "double double", this quadruple system is a fine sight in telescopes of 3" and larger. 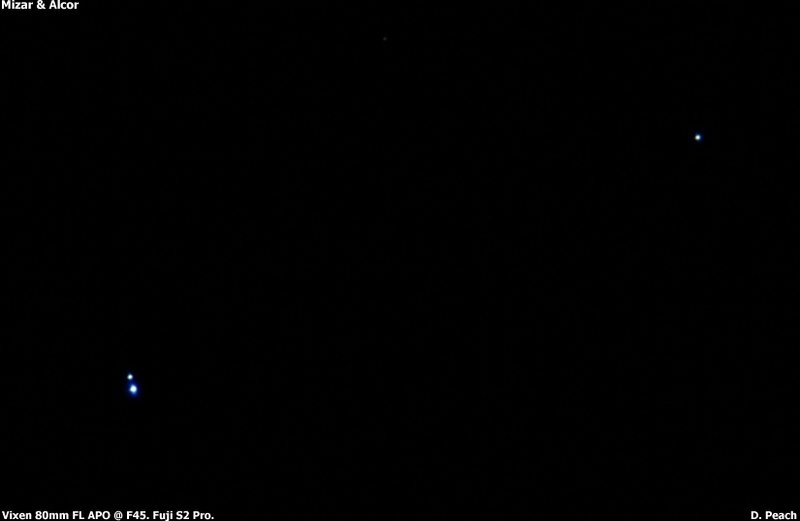 The wider view shows both pairs while the close-up shows Epsilon 2 Lyrae. 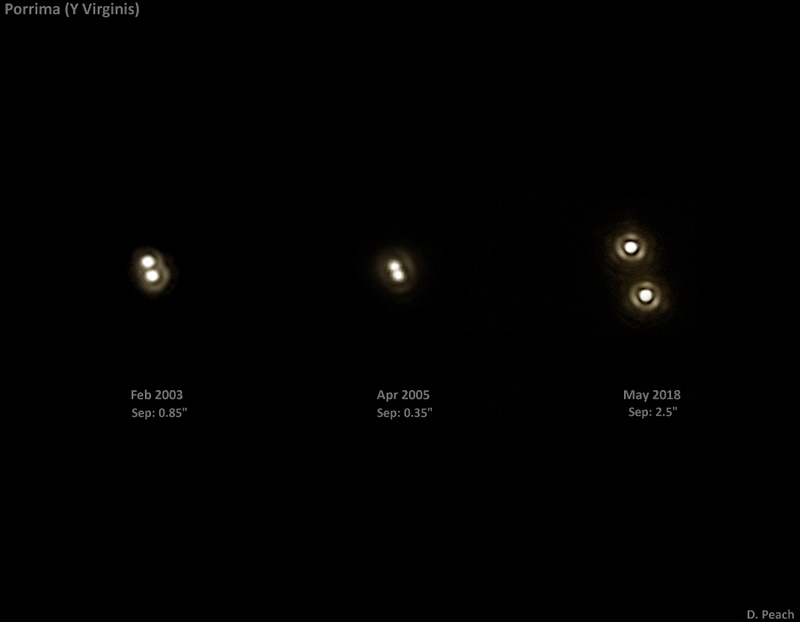 Both pairs are separated by 208", while the closer pairs are just 2.6" and 2.3" arc seconds separation. Left: Vixen FL80s @ F45. Fuji S2 Pro. 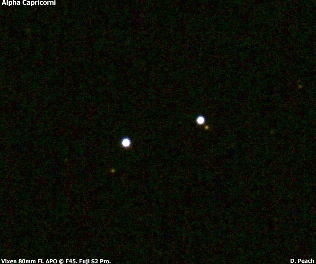 Binary System Alpha Geminorum. Better known as Castor, this bright pair is well seen even in small telescopes. Magnitudes 1.9 and 2.9. The separation is 4" arc seconds. 11" Schmidt Cassegrain @ F31. Philips ToUcam Pro. 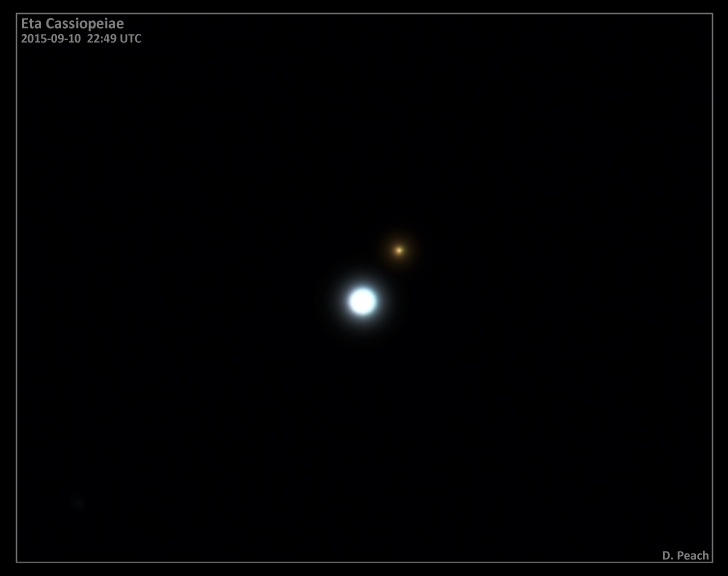 Binary System Alpha Herculis. Another very fine pair consisting of a massive red super-giant star, and a small blue companion. 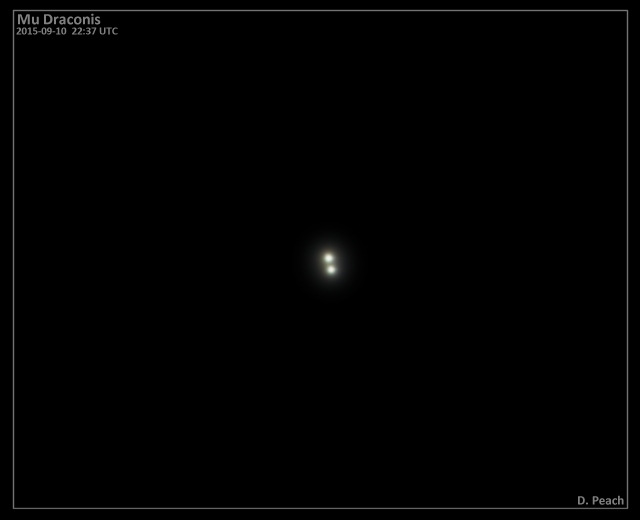 Magnitudes 3.5 and 5.4 with a separation of 4.6" arc seconds. Vixen FL80s @ F45. Philips ToUcam Pro. 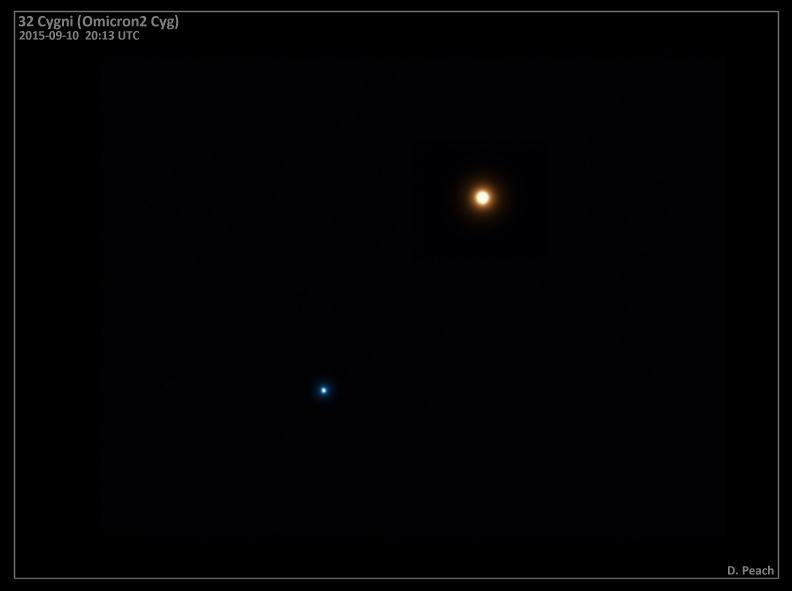 Binary System Beta Cygni. More famously known as Alberio. 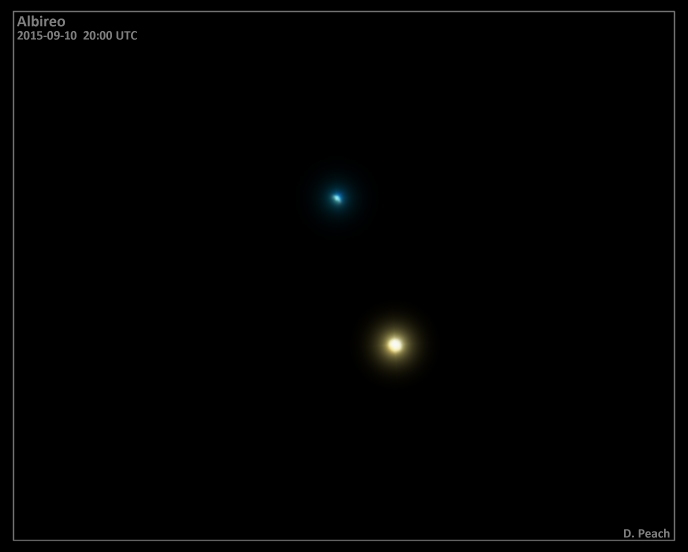 One of the finest binary systems in the sky, with its golden yellow mag 3.2 primary, and blue mag 5.4 companion. The separation is 34" arc seconds. 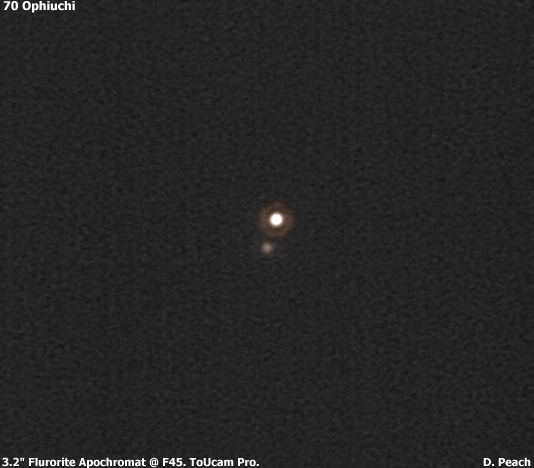 Binary System 70 Ophiuchi. 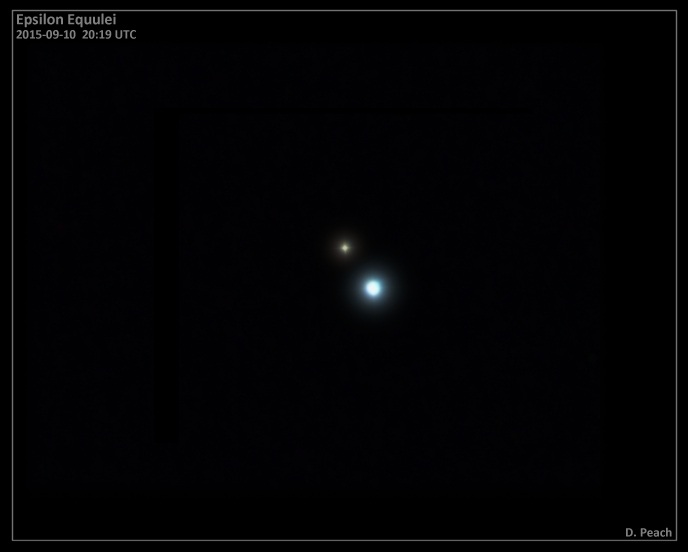 This famous pair has an orbital period of 88yrs. The magnitudes are 4.3 and 6.3, and the current seperation is 4" arc seconds.